Image: Aleksandar Georgiev/E+/Getty Images. Design: Ashley Britton/SheKnows. Although it’s sometimes called a “secondary city,” Brussels is a remarkably friendly destination that’s like an easier version of Paris. It’s filled with history — which you likely never learned in high school — and the city’s culinary offerings are top-notch, especially for those who enjoy the salty crunch of a good french fry. 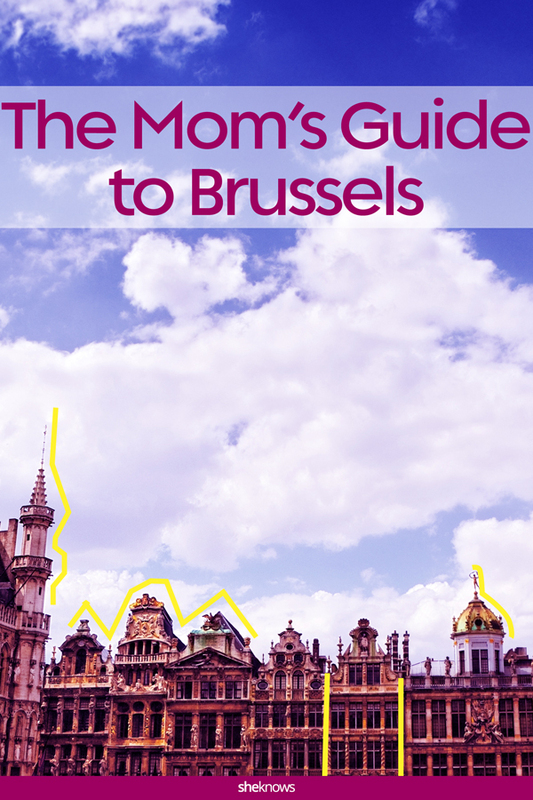 While Europe’s narrow, cobbled streets and immense tourist crowds can be tricky to navigate with kids in tow, the Belgian capitol is fairly compact and easy to traverse with a stroller (plus, taxis are reasonably priced and available everywhere). 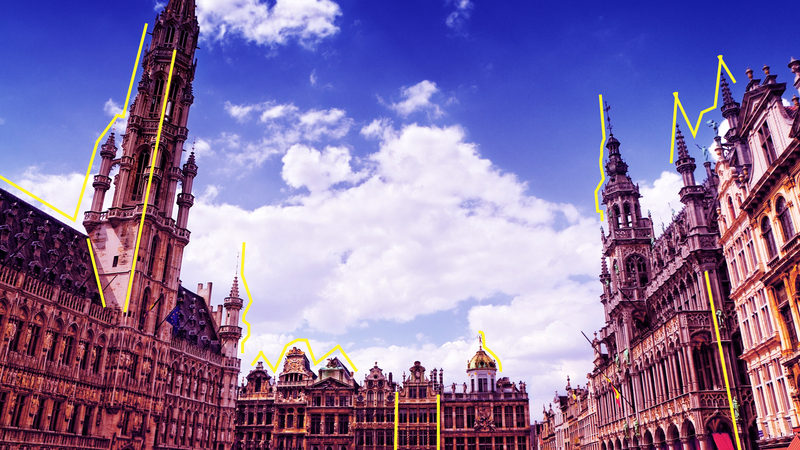 Because Brussels is in less demand than Paris or London, it’s cheapish, and the locals are always at the ready with an explanation or directions. It’s best for those interested in museums or traipsing through parks — not a lot of pool hangs here. It’s a memorable trip, especially when timed with one of the city’s special yearly events. Just be prepared to leave 5 pounds heavier. 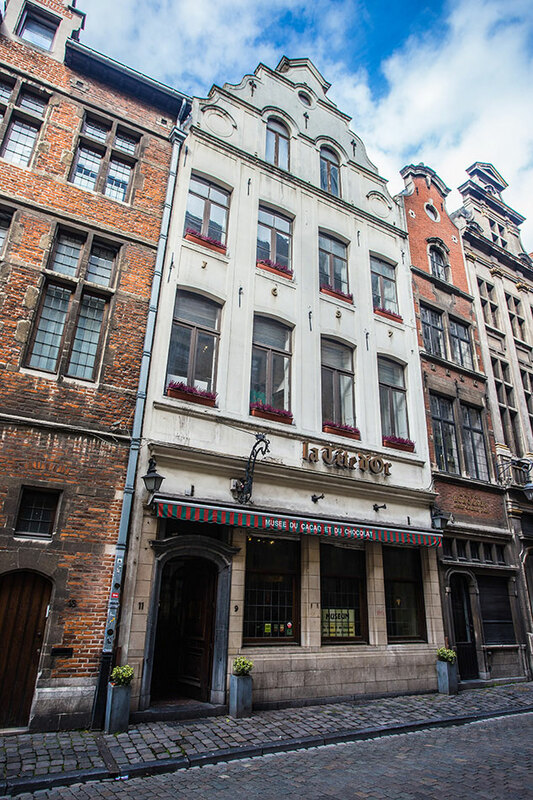 Situated right in the center of town around the corner from the Grand Place, Hotel Amigo, a Rocco Forte Hotel, offers amenities for parents and children alike. Adults will appreciate the five-star amenities, while children are welcomed with coloring books, a special Families R Forte passport and miniature robes and slippers. They can even receive their own Rene, a stuffed baby squirrel who is the emblem of the hotel. Opt for a Brussels suite, which allows for closed doors between rooms in the evening after bedtime. And that bedtime won’t be a challenge: Hotel Amigo specifically tailors their turndown service to guests of all ages. Image: Courtesy of Maison Antoine. No trip to Brussels is complete without the regional dish. Adventurous eaters should grab a table at Chez Leon, an old-school Brussels spot serving up dozens of styles of mussels and thick-cut fries. It’s low-key with midrange prices, and the wine list is an ideal selection of French reds and whites. Best part: Kids under 12 eat free when accompanied by a relative. 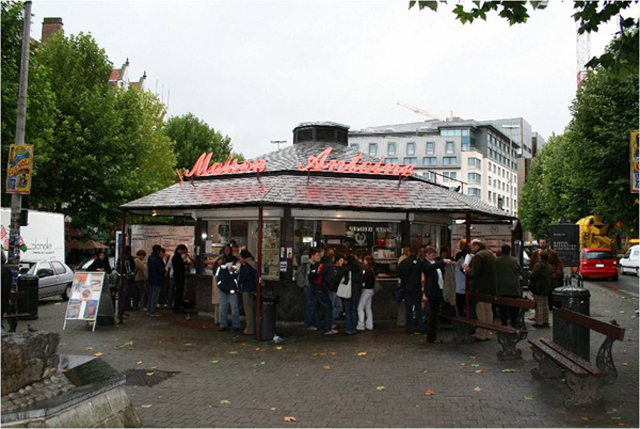 For a cone of greasy fries without the fuss of a restaurant setting, stroll over to Place Jourdan, home to the iconic Maison Antoine. While the long menu advertises various snacks, opt for the traditional pomme frites (aka “french fries”) and then select a sauce or two from an intimidating list that include cocktail sauce and chili sauce (we recommend going with a simple douse of mayonnaise). Pizza is always a safe bet for picky kids, but being in Brussels doesn’t mean settling for mediocre tourist pizza. Hop a quick taxi to the neighborhood of Saint-Gilles, where there’s a pizzeria on every block. Try La Bottega della Pizza’s traditional Italian pies smothered in burrata cheese, basil and a deliciously thick red sauce. Speculoos is fun to say, but they’re more fun to eat. The classic Belgian cookie, traditionally made with brown sugar and butter, can be found all over the city, but the best treats come from Maison Dandoy. Visit the newest location in the Galerie du Roi to indulge in a selection of cookies, a crisp waffle or even some speculoos ice cream. In case of an end-of-day meltdown, head back to the hotel, where the in-house restaurant, Bocconi, dishes up Italian-inspired fare made with Belgian ingredients. It’s not cheap, but the pasta is on point and there’s lots of wine for mom. Image: Vladislav Zolotov/iStock Editorial/Getty Images. It’s a small trek to access the Atomium, a futuristic structure built for the 1958 Brussels World’s Fair, but it’s worth the journey to explore Mini-Europe. 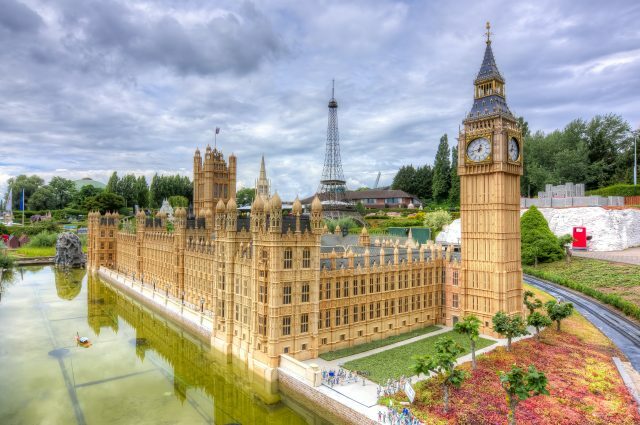 The bizarre attraction recreates many of the continent’s iconic sights in tiny form, from Big Ben to the Berlin Wall. Open daily, it’s a great way to let kids explore Europe and its history on a small scale. Combine your ticket with a visit to the Atomium or the Océade water park. The museum of natural sciences boasts the largest dinosaur gallery in Europe, with over 1,000 specimens of extinct creatures to see. The museum, easily located near Leopold Park, also features temporary and permanent exhibitions on bugs, rocks and minerals, nature conservation and animals. Young visitors can follow themed trails throughout the museum’s galleries or pay a visit to the dino-centric paleoLAB. Grab lunch or a snack at the Dino Café, which serves up family-friendly fare. This one might sound a little weird, but the explorers in the family will get a kick out of Brussels’ Sewer Museum. The excursion heads underground to the 17th-century sewer system, revealing a usually unseen aspect of the metropolis. Anyone under 18 gets in free, and the museum also hands out an ExploRATion notebook to older kids. And don’t worry. You’ll only see a section of the sewers that is regularly cleaned, so no hazmat suit necessary. In warmer weather, take a jaunt through Brussels Park, a green expanse in front of the city’s Royal Palace. There are food stands, tables and toilets, but most important, a lively playground. It’s walking distance from the center, but families can also venture south to the Porte de Hal playground, which has a giant wooden castle construct that encourages the imagination. Image: Courtesy of Brussels Museum of Cocoa and Chocolate. Don’t even bother coming home from Brussels unless it’s with a collection of Belgian chocolates for family and friends. The city brims with chocolate shops, from museum-quality bites to tourist-friendly outlets. One good way to select your treats is by visiting the Brussels museum of cocoa and chocolate, which brings guests through an educational experience before loosing them in the museum shop. Otherwise, aim for one of the boutique chocolatiers, like Galler or Pierre Marcolini. Those in the market for new toys (and what kid isn’t?) will find a trove of treasures in Serneels, located along Avenue Louise. From stuffed animals to board games to robots, this shop has what you’re looking for — at a price, of course. And if they don’t have the exact right baby doll, The Grasshopper in Grasmarkt will. Image: Courtesy of Emily Zemler. Like any European city, Brussels draws several special events on an annual basis. 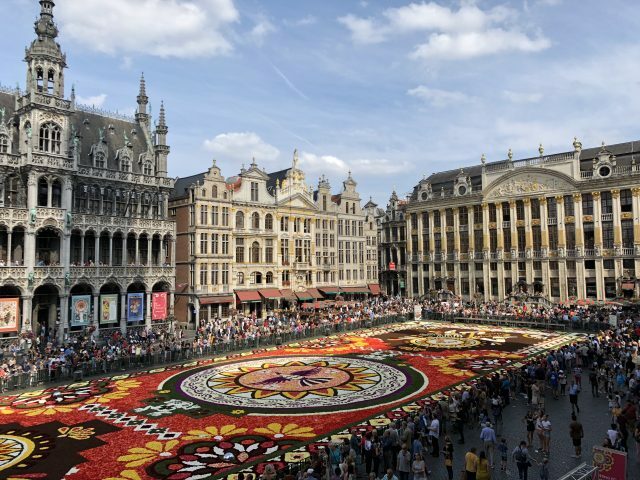 One of the most spectacular is the Brussels Flower Carpet, where thousands of real flowers cover the Grand Place in a pattern every two years over the summer. Visitors can climb to the balcony of the town hall for a sweeping view of the colorful creation (and to document it for jealous followers on Instagram). In the wintertime, the Christmas markets bring a festival flair to the city, covering various areas with shopping stalls, rides and ice rinks. The Christmas markets traditionally runs from November through early January, offering ample time to celebrate the holidays with a glass of hot cocoa — or mulled wine.